In both research and practice, the role of teacher and learner has shifted over recent years. In the traditional approach to college teaching, the instructor was the “sage on the stage” and students passively received their messages. The dynamics of the classroom have evolved dramatically to include a host of active-learning opportunities for students. Faculty often strive to engage students and offer them a learner-centered environment where they develop and reinforce skill sets, using and building upon content from all courses to assist their success in life, beyond academics and the classroom. In addition, faculty engage in professional development through presentations in teaching and learning enhancement, explore and complete online classes on innovative pedagogical strategies, and use lessons learned in and out of their classes to make learning an active process that yields results. 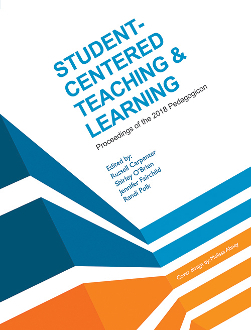 The contributions in the 2018 Pedagogicon Proceedings offer perspectives and strategies focused on student-centered teaching. Readers will find a breadth and depth of approaches contained in this collection. We look forward to continuing the conversation with colleagues from around the country, as well as globally, as we advance excellence in student-centered teaching and learning. Russell Carpenter, Shirley O'Brien, Jennifer Fairchild, & Randi Polk served as editors of this publication.